Collecting issues #7 – 12 of Dark Horse Comics’ Conan The Avenger series, this volume sees Conan and his group of warriors – affectionately dubbed “Amra’s Bastards” – joining up with the army of the disgraced Prince Almuric. However, while the Prince has pillaging and conquering on his mind, Conan has his own agenda; a lost horde of legendary gold that he and his “Bastards” may just have found the key to discovering. It takes a couple of issues for this arc to really get going, but once Van Lente hits his stride in the second half of the story, it becomes a truly gripping read. The journey sees Conan joining Almuric’s army as they sack a city, carrying out his own mission to rescue the sister of a slave girl his company previously liberated; a slave girl who may know the location of this legendary treasure trove. This gradually leads on to a bigger threat as Conan and co. try to cut ties with the army, and features an amply helping of evil wizards and ancient curses and prophecies along the way. The volume is packed with the typically unsubtle dialogue commonly associated with the genre, and while some of the barbarian bluster is a little full-on at times, Van Lente handles it with a sense of charm throughout, managing to pack in some intriguing plot developments along the way. As with a lot of Conan tales, this is definitely a case of plot over character, with the protagonists and antagonists frequently feeling like one-dimensional cliches operating in front of a rich, detailed backdrop. Van Lente does remedy this in the later stages of the story however, throwing some much needed heart into the story and giving some additional depth to the characters — well, those characters who are still alive, that is. It’s also worth mentioning that, as with a lot of these volumes, the story works well as a stand-alone read, with no real prior knowledge required in order to fully appreciate the narrative. Yes, there are callbacks to previous events, and some familiar faces from Conan’s past do raise their heads in this arc, but everything is handled within these pages, filling in the blanks and providing any necessary exposition in a clean, unobtrusive manner. One thing that truly helps elevate this volume is the artwork of Brian Ching. With a scratchy, kinetic style that feels vaguely reminiscent of acclaimed Conan artist Cary Nord, Ching gives his pages a sense of dynamism throughout, and even if his depiction of Conan is perhaps a little scrawnier than I’d prefer, the overall aesthetic of the book is truly impressive. Ching also displays an innate gift for choreography, giving the frequent skirmishes a sense of fluidity and as well as a satisfying feeling of connection as the blows are thrown and landed. The also book is packed with gorgeously rendered splash pages and double-page spreads that really help to make Van Lente’s storyline beats find their mark. Overall then, while the story itself is hardly revolutionary, and does fall into some of the more typical fantasy comic tropes at times (rescuing beautiful slave girls, battling nefarious sorcerers), the execution is nonetheless impressive. Van Lante has a firm grasp of Conan’s voice and knows how best to structure a story complete with twists, turns and gradual, rewarding character development. Artistically, the volume is truly stunning from start to finish, and while there are undoubtedly better Conan stories out there on the shelves, there’s no denying that this is still a gripping, dynamic and visually impressive slice of fantasy fun. 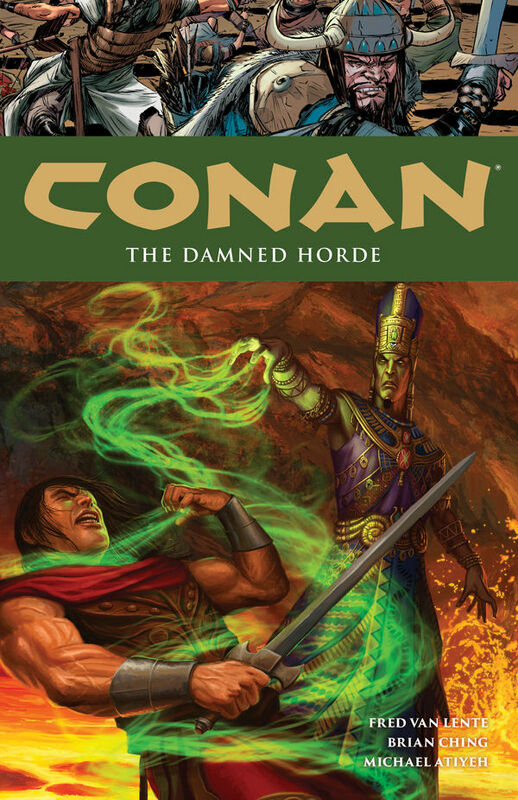 You can purchase Conan Volume 18: The Damned Horde TP from Turnaround Publisher Services (who generously provided the review copy of this title) via their official website.